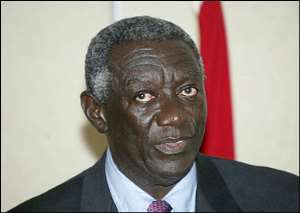 --- Download Full Speech Accra, Feb. 3, GNA - Improvement in the economy and human resource development formed the basis of President John Agyekum Kufuor's State of the Nation Address to the First Session of the Fourth Parliament of the Fourth Republic of Ghana at Parliament House in Accra on Thursday. The following are the highlights: Economy: More impetus into revenue mobilisation to reduce Government's domestic borrowing and more credit to local investors. Human Resource Development: National Council for Technical and Vocational Education and Training to be established under the Ministry of Education and Sports. Cost of one-year Apprenticeship Course to be borne by the State. By the year 2015, all Primary and Second Cycle Schools to be staffed with professionally trained teachers. Teacher Incentive Schemes to be reviewed and expanded to benefit more teachers. Government to undertake Faculty Development in the Public Universities to attract and retain young people into the profession. Government to continue with investments into the Polytechnics to help them grow in self-confidence. Revised National Telecommunication Policy has been published and the Ghana Investment Fund for Telecommunication (GIFTEL) is being established to extend the telecommunication infrastructure to cover both the public and private sectors. Work on the construction of two new stadiums at Sekondi and Tamale to commence this year. The Accra and Kumasi stadiums to be renovated and upgraded, while community parks and other stadiums in the Regions and Districts would be upgraded. Government has released 4.5 billion cedis to improve and expand the facilities at the Youth Leadership and Skills Institute at Afienya. The National Health Insurance Scheme (NHIS) will be fully implemented with in-built protection for the poor and vulnerable. National Ambulance Service to be extended to other Regions as well as the establishment of Accident and Emergency Centres in health institutions in all Regions. Government to launch a National Identification Exercise this year. Ayensu Starch Company (ASCo) at Awutu-Bawjiase in the Central Region established under the President's Special Initiative is expected to export 10,000 tons of industrial starch estimated at about 2.8 million dollars this year. Two new similar starch companies will be established in two other Regions this year. A reviewed Housing Policy Document for Low cost Housing Programme to be placed before Parliament this year. Private Sector Initiative for the construction of an initial 10,000 units of houses nation-wide is expected to commence this year. - SSNIT/Malaysian Housing Programme to provide 100,000 units countrywide will come on stream. Ghana International Airline has been incorporated. Government to introduce a Water Policy Bill In Parliament this year. Government to take a decision on the deregulation of the Petroleum Sector this year. The passage of the Right to Information Bill and the Whistle Blowers Bill will be a major priority for Good Governance this year. Increased budgetary support for Commission on Human Rights and Administrative Justice (CHRAJ), National Commission on Civic Education (NCCE) and the National Media Commission (NMC) this year. The equipment and strength of the Ghana Police Service will be enhanced in addition to the training and re-training of Police personnel. Government's good neighbourliness policy within the ECOWAS Sub-Region and Africa, which has earned Ghana a good international image and opened up significant investment opportunities, would be continued.